HE WAS A VERY HONEST MAN WHO LOVES GOD TO A FAULT. ALL THROUGH HIS LIFETIME, HE CHERISHED INTEGRITY AND LOVE, THE VIRTUES HE HELD IN HIGHEST ESTEEM TILL HE CONQUERED DEATH RECENTLY. 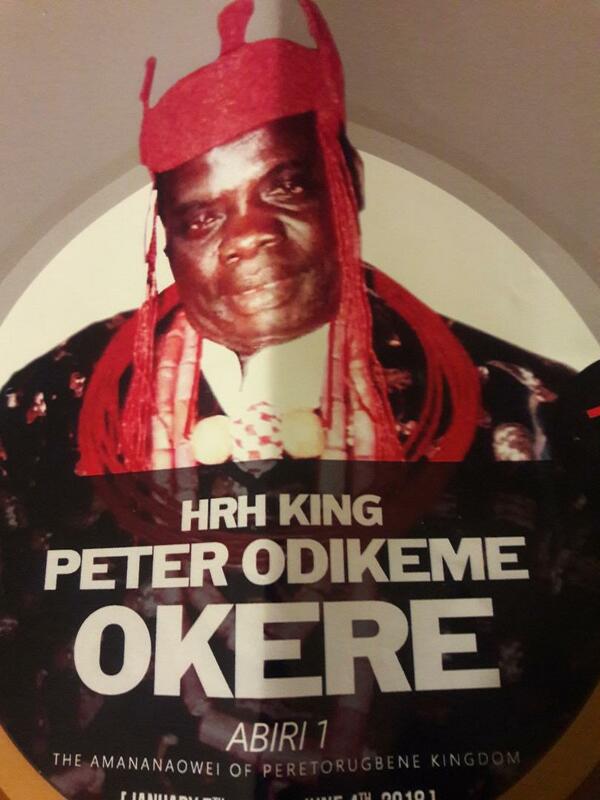 HRH KING PETER ODIKEME OKERE, the Amananaowei of Peretorugbene Kingdom in Bayelsa State ABIRI 1 lived a life of godliness, truthfulness to God and men till he had his last breath. Due to his evergreen positive impact on millions of Niger-Delta youths, Nigerian community from all walks-of-life in Texas converged in Redeemed Christian Church of God’s House (RCCG) on the Rock yesterday, Friday, November 23rd to honor this great Nigerian icon as he finally bid the world goodbye to live in eternity in the presence of saints in Heaven. Moderator for the ceremony was Albert Kalu, while opening prayer was said by Pastor Wally Bello. RCCG Choir were on standby as they dished out worship tunes to the praise of God’s omnipotence and sovereignty. By the time Deaconess Ebiere Nicholas, daughter and Princess to the monarch was asked to give the Eulogy, it was clear to all present in the church’s auditorium that the bond between her and her father was very strong, as her voice was almost fainting in reading aloud the virtues and inestimable impact of her late Dad to humanity. At this juncture, her husband, Pastor Nicholas Lawrence took out few tissues to wife her wife’s emotionally-laden tears. This enviable monarch was respected as man of peace and a bridge-builder. Princess Ebiere continued: “Peter Odikeme Okere was acknowledged as abridge builder between the Management of the Pharmacy departments of these General Hospitals, the State Hospital Management Board and the Ministry of Health, Benin City. As he was always called to restore peace and the dignity of the profession whenever, wherever crises arose within the pharmacy departments of those General Hospitals. He was an epitome of discipline, truthfulness, both at his workplace and secular life-he became a model to many. 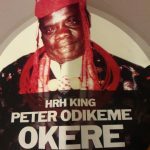 This correspondent gathered that HRH King Peter Odikeme Okere immensely contributed to the development of humanity in the generality of Izon-ebe and Peretorughene community. He has always been high driven to his career oath of saving life as a medical practitioner, Human Capital Development especially among youths and Conflict resolutions. This great monarch fought the epidemic of Cholera outbreak in 1971. A year after the Nigerian Civil War, there was an out-break of a great epidemic that claimed so many lives in Western Ijaw Division of the then mid-Western State and Peretorughene was not an exception, which was not an exception that medical experts confirmed as Cholera. Till date, the success story of Bayelsa State cannot be told without mentioning the heroic contribution of HRH Peter Odikeme Okere who was a pioneer in the community that encouraged and assisted the youths to gain employment, acquire skills and western education. Pastor Kuye the invited other pastors in the congregation to come up the alter and join him in conducting prayers for the family. Another ‘man-of-God’ from Nigeria, Pastor Kayode eventually rounded up the family prayer. Offering was conducted by Deacon John Awe, as the Closing Hymn titled ‘It is so Sweet to Trust in Jesus’ readily came in handy. Pastor Nicholas Lawrence, husband to Princess Ebiere gave the ‘Vote of Thanks.’ And the final Closing Prayer & Benediction was done by by Pastor Mrs Moji Peters. He was married with 11 Children amongst whom are the first male and female Petroleum Engineers from Peretorughene community and blessed with 20 Grand-children.